Oral Allergy Syndrome (OAS), also known as the pollen-food syndrome is an allergic reaction that affects the oral cavity after the consumption of food. The reactions in Oral Allergy Syndrome are limited to lips, throat, tongue and oral mucosa. Unlike other food allergies, other parts of the body are not affected. Such an allergy is triggered after an individual who is allergic to pollen consumes certain vegetables, fruits, and nuts. Cross-reactivity between pollen and proteins present in various fruits and vegetables can cause Oral Allergy Syndrome. Individuals who are allergic to grass pollen, birch pollen, and ragweed pollen are likely to have Oral Allergy Syndrome. Clinical History: Talk to your physician about your food intake and symptoms that appear after the intake of a particular food. Tell your doctor about your symptoms in detail and about your medical history. Blood Test: The level of immunoglobulin E increases in the body after a person susceptible to allergy comes in contact with the allergen. High blood levels of immunoglobulin E is an indicator of allergic reactions. Skin Prick Test: Besides clinical history, skin prick test must be performed to confirm the results. During this test, your doctor pricks your skin with the help of a lancet and an extract of pollen, vegetables or fruits is applied to it. Undesirable skin changes are a clear indicator of allergy. Individuals with allergic rhinitis are at an increased risk of developing oral allergy syndrome. People who are allergic to birch pollen, ragweed pollen, and grass pollen have higher chances of developing oral allergy syndrome. Symptoms of oral allergy syndrome set-in quickly without any complications. Usually, the symptoms are confined to the mouth, but in severe cases, symptoms may spread beyond the mouth area after the consumption of raw vegetables, fruits or nuts. In such cases, immediate medical attention is required. The easiest way to treat the oral allergy syndrome is to avoid the foods that cause the problem. Foods that cause clinical allergy need to be avoided. In case of a single allergen, immunotherapy may be beneficial. It is a therapy in which, the body’s immune system response is modified. This treatment can be used to decrease the severity of symptoms related to oral allergy syndrome. Some individuals are allergic to certain foods in the raw form. Cooking the food properly and avoiding raw intake of such foods can be beneficial for such individuals. 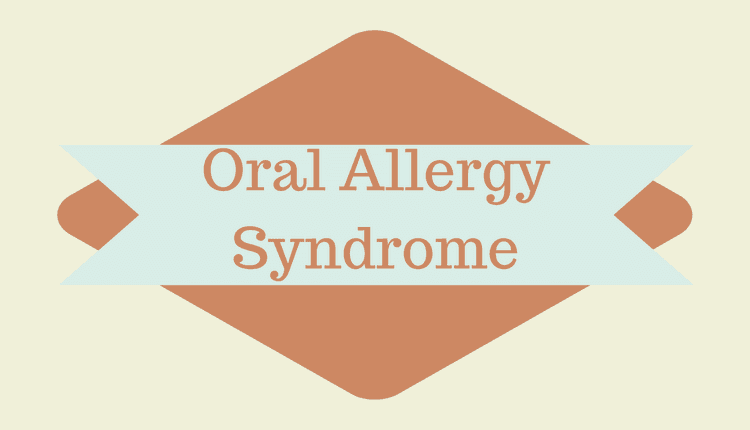 Accidental ingestion of trigger foods can cause symptoms of oral allergy syndrome. During this time, quickly remove the food from the mouth. Immediately rinsing the mouth with water can also help in lowering the symptoms. Completely avoid intake of raw foods. Cook your foods properly because heat treatment may promote elimination of allergens present in the food. Purchase a canned version of vegetables and fruits. The problem causing protein is usually present in the skin of fruits and vegetables. Peeling the skin of such foods may be helpful.